A third-generation Adirondacker from Saranac Lake, Lisa Densmore Ballard wrote in her Hiking the Adirondacks in 2010 that “writing a guidebook is really an excuse for an adventure.” Ballard has not given up seeking adventure: this year, she released an expanded edition of her guidebook. Two new guidebooks by Lisa Densmore Ballard. 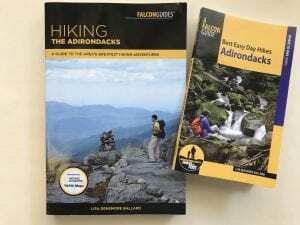 She also has released a new edition of her shorter guidebook, Best Easy Day Hikes Adirondacks, though it is little changed from the first edition. As the title suggests, Best Easy Day Hikes is aimed at casual hikers and families with young children. At 110 pages, it’s small enough to slip into your back pocket. In contrast, the second edition of Hiking in the Adirondacks is much different from its predecessor. All of the photographs and maps are now in color. Also, the maps are now topographical, with contour lines for visualizing the terrain. All of the hikes found in the first edition are in the second. In addition, you’ll find five new ones: Debar Mountain, Phelps Mountain, the Jay Range, Mount Marcy via Elk Lake and Panther Gorge, and a loop that includes Mount Colvin. Given that there are over two thousand miles of trails in the Adirondack Park, you can always quibble about the hike selections in a guidebook, but Ballard has done an admirable job in choosing forty-seven outings that will appeal to a variety of people—dog lovers, families, solitude seekers, landscape photographers, and seasoned backpackers. She reveals that her own favorites are, in no particular order: Hurricane Mountain, Catamount Mountain, Mount Colvin Loop, Lyon Mountain, and the Avalanche Lake-Mount Marcy Loop. Easy to read, the book is split into six regions of the Adirondack Park: Northern, Eastern, Western, Central, Southern, and the well-traveled High Peaks. Hike lengths range from an afternoon outing of four miles with only five hundred feet in elevation gain to a full day’s commitment of ten-plus miles with over 2,500 feet in elevation gain. Each chapter gives a brief overview of the hike, including start time, total distance, difficulty, estimated hiking time, vertical gain, and the nearest town where you can fuel up on snacks before the outing or snag ice cream afterwards. Ballard includes charts to help readers choose hikes based on various attributes, such as an open-rock summit (44), a fire tower, (14), or a scenic lake or pond (8). She begins the guidebook with a “Before You Hit the Trail Section” that clearly shows she has done the homework, so you don’t have to. The chapter discusses the region’s history, weather conditions, backcountry safety, camping advice, and common wildlife conflicts. Sidebars on such topics as timber rattlesnakes, forest fires, and the nineteenth-century guide Old Mountain Phelps are scattered throughout the book. Besides writing the text, Ballard took most of the photos in the book. Most are of scenery, but there are also close-ups of flora and fauna. She is as adept with a camera as she is with a pen (or word processor). Hiking the Adirondacks is 340 pages and sells for $24.95. Best Easy Day Hikes sells for $12.95. Both are published by Falcon Guides.